Triangle’s Carl Fletcher produced what must rank as one of the best performances in Halifax League history with an astonishing display at SBCI yesterday. ‘Big Carl’, who started the month by sealing Triangle’s Parish Cup final victory over Mytholmroyd with a huge six at Sowerby Bridge, finished August with 143 not out, eight wickets for 32 and a hat-trick! Fletcher dominated the contest at The Astleys and helped Triangle to a 56-run success. The visitors made 237 for nine, Fletcher and last man Dave Turner, the next high scorer with 22 not out, adding 107 after Jamie Sykes’s five wickets had seemingly put the hosts in charge. Fletcher still had the energy to bowl 17.2 overs and he cut through the home ranks after Tom Conway (43) and Chris Dalby (41) had helped the hosts to 110 for two. His hat-trick came with the total on 169, three straight deliveries accounting for the numbers seven, eight and nine batsmen, William Thickett, Simon Wood and Sykes, to hasten SBCI’s demise. Jer Lane’s lead over Booth at the top was cut from four to two points with two rounds of fixtures left. Lane were stretched at home by a Blackley side determined to stay clear of the bottom two. Lane managed just one bowling point in the first half of the contest as Blackley posted 271 for four. Inevitably there were runs for Reece Jennison - 92 of them - and he was ably assisted by Daniel Houldin (86 no). The leaders stayed unruffled and won with five wickets and three overs to spare with Wayne Cotton (70) and Simon Collins (68) their top scorers. Patrick Thomas had a fine match as a Booth side lacking a handful of regulars rose to the task at home to third-placed Thornton. Thomas took five for 33, including the wicket of Thornton’s leading scorer Mick Shanks (55), to dismiss the visitors for a modest 169. Thomas (38 no) and Usman Saghir (22 no) then completed the task with an unbeaten stand of 49 as Booth recovered from a perilous 89 for five to win by four wickets. Bottom side Southowram bagged a fifth win of the season but are still 99 per cent certain to go down. The Rams were two wickets winners over Mytholmroyd after Gavin Moody’s five for 34 had helped dismiss the free-falling visitors for 74. Paceman Jack Earle almost pulled the game out of the fire for ‘Royd with seven for 42. Queensbury are favourites for the second relegation spot after an eight-run defeat at Copley. Hard-hitting Chris Dennison made 84 at the top of the home order and Mark Baldwin (50 no) and Mohammed Seraj 47 no) took the total to 206 for four as ‘Bury used spinners Amjad Ali and Girdev Singh throughout. The visitors fell just short in spite of a fighting 46 from No 9 Russ Irving. Warley were dismissed for 113 in reply to hosts Sowerby Bridge’s 198 all out. Points: Jer Lane 189, Booth 187, Thornton 156, Sowerby Bridge 148, SBCI 144, Mytholmroyd 144, Copley 141, Triangle 140, Warley 139, Blackley 129, Queensbury 118, Southowram 105. Sowerby St Peter’s duly clinched the Division One title yesterday with an easy eight-wicket win at home to Luddenden Foot. Martin Schofield and Chris Punda took nine wickets between them as Foot were dismissed for 130 and Ryan Brook anchored the successful reply with an unbeaten 41. The battle for second spot intensified when Oxenhope beat visitors Northowram HT by 81 runs to close the gap to six points. All now rests on next week’s final matches with both away to the bottom two, Bradshaw and Luddenden Foot, who have slight chances of avoiding the drop. Stones have an eight point advantage over the bottom two after a crucial 67-run win at Bradshaw. Joe Akroyd’s 36 not out helped the Swift Cross side to 166 and he followed up with three for 27 as Bradshaw just failed to make it to three figures. There was an end-of-term feel to things at Low Moor where Bridgeholme were winners between the mid-table pair by 29 runs. That was in spite of visiting skipper Chris Kibble giving all his 11 players a bowl. The last of them, Oliver Challis, showing how it’s done with three for 24 as Moor made 168 with half-centuries from Nick Wood and Andy Croasdell. Earlier, Tom Stansfield 85 had helped the Eastwood side to 197. Points: Sowerby SP 206, Northowram HT 175, Oxenhope 169, Bridgeholme 149, Low Moor 125, Stones 116, Bradshaw 108, Luddenden Foot 105. It was pretty much the perfect day for Old Crossleyans in Division Two. They registered a thumping 142-run home win over champions-elect Great Horton Park Chapel and saw their rivals for second spot, Outlane and Clayton, both lose. Crocs, who went nine points clear of that pair with two games left, piled up 267 for eight at Broomfield with Jonny Sykes’s 67 the top contribution. A superb disciplined bowling performance by evergreen Richard Dixon limited the leaders to 125 for nine in reply. Dixon took six for 38 in 19 overs. Clayton lost to Denholme Clough while Outlane went down narrowly to improved Old Town, who could climb out of the bottom two if they win next week’s return contest. Jahangir Khan took four wickets and Saj Mahmood’s 42 not out saw Old Town to a target of 195 in a nervy finish. 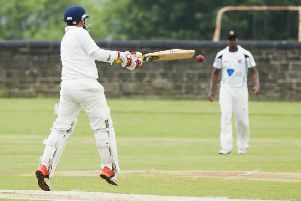 Bottom club Greetland received a welcome fillip with a six-wicket win over Shelf. Christian Soulsby’s five for 39 included a hat-trick and opener Scott Whelen made an unbeaten 54 not out on a tricky surface to ensure Greetland’s earlier good work was not undone. Points: Great Horton PC 187, Old Crossleyans 172, Outlane 163, Clayton 162, Cullingworth 145, Shelf 144, Upper Hopton 124, Denholme Clough 123, Old Town 117, Greetland 76.